Many years ago, I mused about the fact that there was one law in England that you had no way of knowing that you were breaking – the drink driving law. It’s legal to have <80mg/ltr of alcohol in one’s blood stream and still drive. However, we Brits were specifically disallowed the ability to test our blood alcohol level. If you murder someone, you know you’re breaking the law – it’s an absolute. Break into a house and run off with someone else’s TV and stereo and you know you’re committing an offence. That’s an absolute. If you drink a little, however, there’s no way to tell whether you’re allowed to drive or not. Of course, one could adopt the zero drink approach (as required, I think, in Norway – or is it Sweden?) but that makes a nonsense of our allowing an acohol level of <80mg/ltr. Why are we not allowed to purchase breath test equipment? It makes no sense. Today is an interesting day in France. From today it is compulsory for all cars to carry an alcootest [breathalyzer], hence my B-Day terminology. Our driving organizations recommend carrying two so that, if you have to use one, you still have one fulfilling the legal requirement. For a few weeks, when out shopping we wandered around looking to purchase said alcootests and eventually got some in a newsagent inside an hypermarché. We’ve got four. Ready! Whilst this might have been seen as a nuisance requirement, how sensible it is. In France now, not only can you test your alcohol level but you must be able to. Much more sensible than stupid old Britain where you are forced to guess. Bravo France! Anyway, with friends Mike and Linda having left us for a blues festival at Cognac, we were left to face B-Day on our own. We decided on another trip to the coast, this time to investigate Fouras, just south of La Rochelle. We took the bikes, parked up and pedalled about, though it was a close run thing since Mr Bozo, Franco, forgot to pack Guillaume’s step to gain the height required to retrieve and replace the cycles. Sometimes, being Twizzle [sorry America, reference to a very old English childrens’ TV show] would be really useful. Somehow, I stretched myself enough to manage. Just off the coast of Fouras is the Île d’Aix where Napoleon was imprisoned for a while. A ferry runs regular services from Fouras to the island but we just watched and said, “ooh, ah!”, not being that kind of tourists. This is seafood country where the good ol’ French grow excellent moules de bouchot. The bouchots are wooden stakes upon which the mussels are grown. 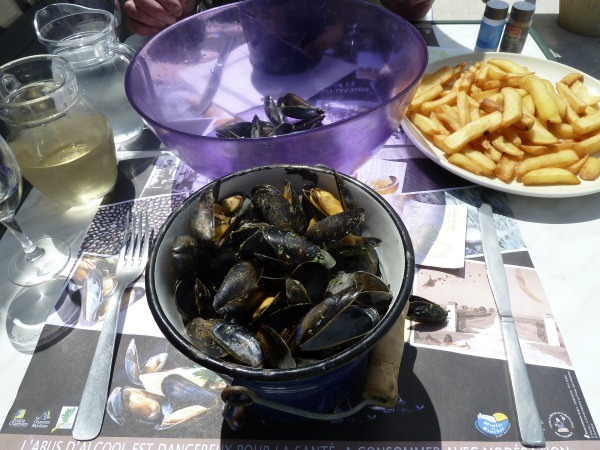 Much more interesting than a trip to Napoleon’s erstwhile prison was a traditional moules et frîtes lunch. After a look around the town, including its bustling Sunday market, we chose a waterside restaurant advertising our desired meal and sat down to a very enjoyable, if somewhat naughty, feast. I must point out the following. Look at the chips/French fries/frîtes in this picture. In stark contrast to the limp, flaccid, soggy items served up by our chosen lunch restaurant (la Guingette) at Argens-Minervois on the canal du Midi a few weeks ago, this restaurant did not need a lesson in cooking chips. These frîtes left nothing to be desired; they were fluffy on the inside, crisp and golden on the outside and not at all oily – perfect!